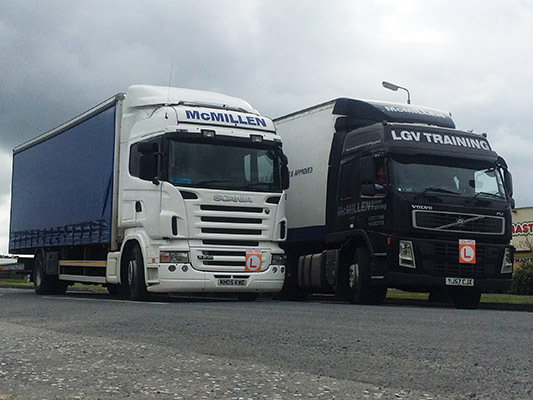 McMillen Driver Training is one of Northern Ireland’s leading providers of Driver CPC, HGV and LGV training. For more than a decade, the family-run concern has been helping candidates pass their driving tests and embark on successful careers in the transport industry. Established in September 2005 by John (Sean) McMillen, McMillen Driver Training enjoys an enviable reputation for the training services it provides. Training is available to both commercial and private clients at its training centre at 100 High Street, Lurgan, Co. Armagh. John and his sons Anthony, Timothy and Jamie are full trained and accredited with the company, being members of ITSSAR, OCR, SQA, FSB and RTITB. With these accreditations, you can be assured that your training needs will be in the hands of competent and experienced professionals. McMillen Driver Training offers a wide range of courses for different vehicle types. These include Driver CPC Course Periodic Training, LGV (Large Goods Vehicle), HGV (Heavy Goods Vehicle, Forklift Trucks, ADR (all classes 1 to 9) and Driver CPC Modules (2 and 4). In addition, manual handling and fire safety training courses are available. Explaining the background to the driving centre, Anthony McMillen says: “My father, who is a retired fireman, had been trained as a driver advisor from 1991 before setting up this business. I came on board in 2008 and my brothers Timothy and Jamie are also involved in the business. The McMillens pride themselves on the success of their students. They have a very high pass rate, always making sure the candidates are well prepared for their theory and driving tests. “We train them to the highest possible standards. Having said that, we can’t do the test for them. We can only prepare them,” Anthony says. All of the training courses, and when they are taking place, are available on request. Outside of the aforementioned courses, there are courses in health and safety, first aid, driver assessment, telescopic handling, bankman and slingers, lorry-mounted loaders, fire extinguisher training, PPE, risk assessment, driver’s hours, digital tachographs, hazard perception, driver and vehicle security, driver health and eco safe driving, driver safety at work, load security and traffic law. As a former fireman and instructor for the Fire Service, it’s no surprise to hear that John specialises in fire safety and fire extinguisher training. He also well versed in ADR and forklift training, while all of the McMillen instructors specialise in Driver CPC training on-site and off-site. “We’re all multi-trained,” Anthony continues. “We provide a step-by-step guide to passing your test and are fully up-to-speed with all regulations and laws. Subject to numbers, we can offer five-day Driver CPC courses in the same week. We can also offer forklift training on request. There are many steps involved before one can obtain an LGV licence. The first step is to contact McMillen Driver Training and they will send you the relevant forms and then you will undergo a medical examination with your own doctor. You then apply for your provisional licence, sending it with the provisional licence application form with completed medical form to the Driver & Vehicle Agency (in Northern Ireland only). On receiving the provisional licence, you will undertake the DSA Modules Theory Test and the Hazard Perception. Once you have passed this, you can complete the test application and send it back to McMillen Driver Training for you five days training for your practical driving test. On receiving your test application, McMillen Driver Training will make an appointment for you. It can take about 14 days for the start date of your training. After passing your practical, you will need to take module 4 at the Test Centre. This course lasts for about four hours, including test. McMillen Driver Training uses two automatic trucks to help you pass your test. One is a Scania R230 rigid, while the other is a Volvo Euro 5 artic. Both were purchased from A&M Commercials in Monaghan.